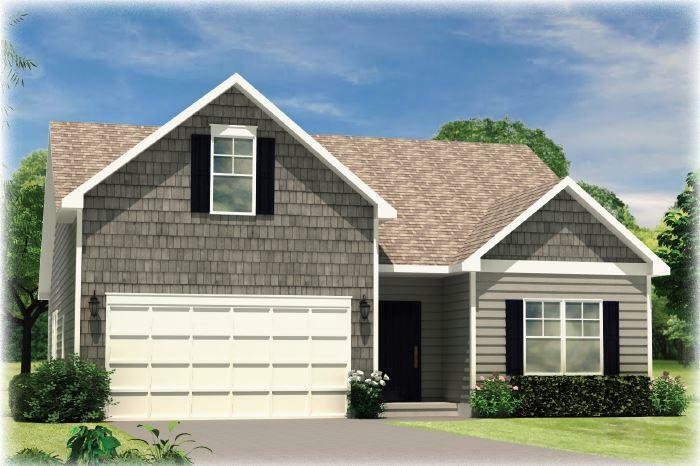 You will love this beautiful 2-3 Bedroom, 2 bathroom, 1,410 square foot home. This charming home includes 9' First Floor Smooth Ceilings with cofferred or trey ceilings per plan, 2 panel textured cathedral style interior doors with Kwikset brushed nickel hardware, 4.25' baseboards and 2.24' casing & shoe molding, crown molding in foyer, 2 piece chair rail in formal foyer, ventilated closet & pantry shelving. 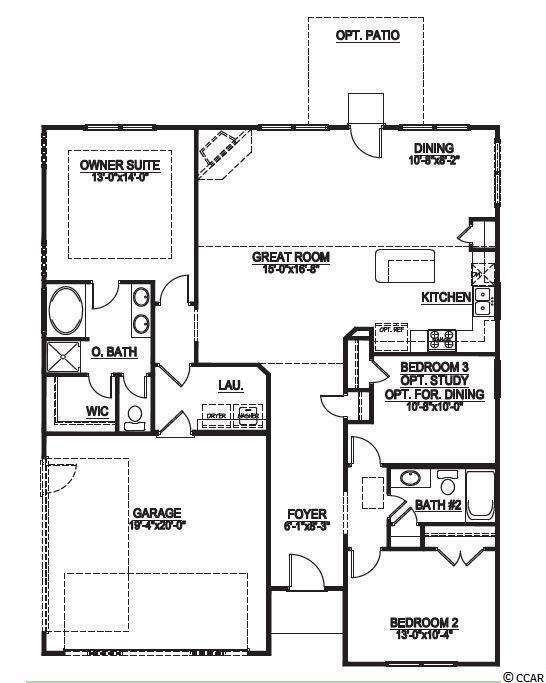 The Interior Features include a designer kitchen with granite counter tops, 8" stainless under mount sink, cabinets: staggered height, flat panel with crown molding and hardware, stainless faucet with pullout spray, 1/3 horse power disposal and Frigidaire appliances (stainless steel, smooth top, self-cleaning electric range, over the range microwave & dishwater). The high tech electrical features include USB outlet in kitchen, phone jacks, cable jacks, recessed lighting & pendants, structures wiring package with smart panel, CAT5 wiring and RG6 CATV, and 2 ceiling fans with light kits (pre-wire all BR). The Exterior features include a 30 year architectural shingles, insulated garage doors with opener, 2 remotes & keypad, professional landscaping package, Kwikset brushed nickel lock set with deadbolts, Low-E insulated windows, 2 exterior hose bibs & electrical receptacles, 2 flood lights on rear of home, aluminum gutters with splash block wraps the home, and a covered porch. With Energy Saving Features: 2x6 Exterior Walls with R-19 Insulation, ecoSelect Certification, TRANE 16 Seer Energy Efficient HVAC system, 95% Efficient Gas Furnace, Radiant Barrier Roof Sheathing, 50 Gallon Gas Water Heater, and Insulated & Weather Stripped Pull Down Attic Stairs. The H&H Homes peace of mind features include a 400 point quality assurance program conducted by an experience third party licensed home inspector, 2-10 home buyer's warranty & online service requests, GEMS Great Expectation Management System, Security System- Exterior Doors, 1 Motion, 1 Keypad, Taexx Built-in Pest Control System, and Sentricon Termite Colony Elimination System (first year semi-annual included). Last, but not least, the amenity package includes a pool, clubhouse, 1.5 acre park, maintenance of all the common areas, street lights, trash pickup and basic time warner cable. 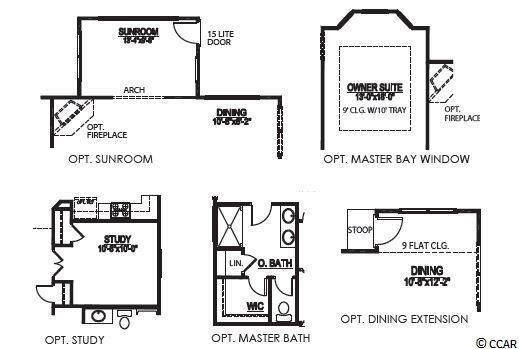 The selections include the optional study, sun room option with level 1 tile floor, 2 optional windows in dining, optional transom window over tun in bath 2, owners suite bay window, add 5" laminate in foyer, family, halls to bedrooms, kitchen/nook, tile in all baths and laundry, legacy plymouth painted kitchen cabinets, delta 9178AR kitchen faucet, rhittenhouse 3x6 subway kitchen back splash, under cabinet lights in kitchen, and light rail trim for under cabinet lights. This home will be ready end of November 2018. Listing provided courtesy of Cb Chicora Advantage Nmb2. Listing information © 2019 Coastal Carolinas Association of REALTORS® MLS. Listing provided courtesy of Cb Chicora Advantage Nmb2. © 2019 Coastal Carolinas Association of REALTORS® MLS. All rights reserved. IDX information is provided exclusively for consumers' personal, non-commercial use and may not be used for any purpose other than to identify prospective properties consumers may be interested in purchasing. Information is deemed reliable but is not guaranteed accurate by the MLS or The Hoffman Group. Data last updated: 2019-04-24T23:20:15.467.